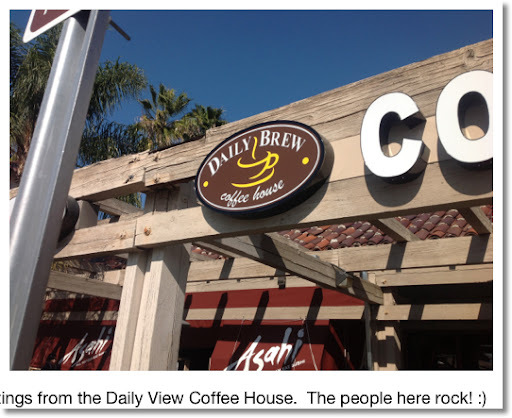 I am blogging today from Daily Brew Coffee House in Riverside, CA. 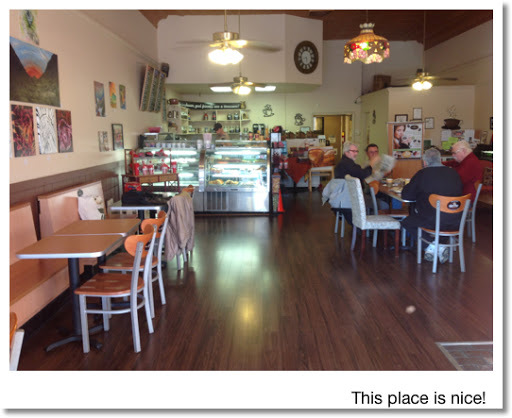 Service here is excellent - very nice and friendly people. 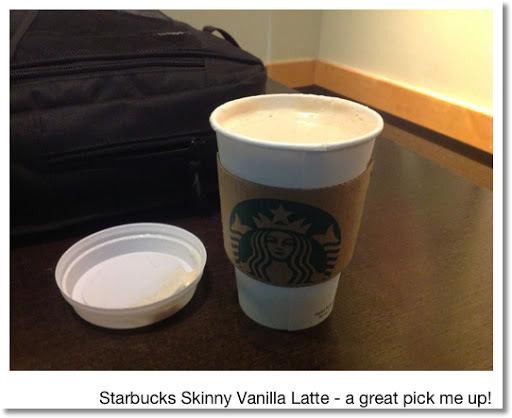 If you get a chance, please check out Mike Grigsby's blog at http://mikebibbygrigsby83.blogspot.com/?m=1. Mike has a Master's Degree in Mathematics from Cal Poly Pomona, and is the Social Media Administrator for the Riverside Astronomical Society. Later tonight I am going to meet with Mike to go their monthly meeting at La Sierra University in Riverside. More information about the Society can be found here: http://www.rivastro.org/index.php. Mike is a super duper awesome guy. Please check his blog out. Short and sweet, the nSpire app is everything the TI nSpire hardware is. 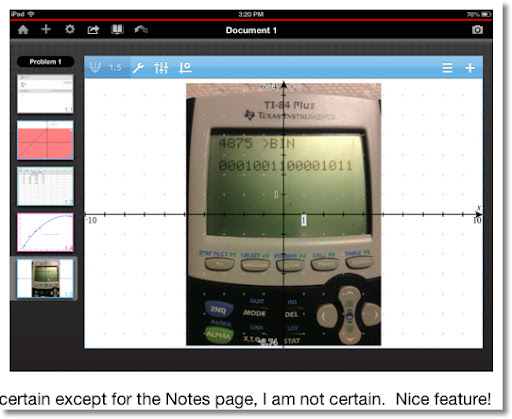 Unlike most calculators, the nSpire operates as a computer software interface (think closer to Mathematica, Matlab, or Maple) than the traditional calculator. You work on documents which contains pages. 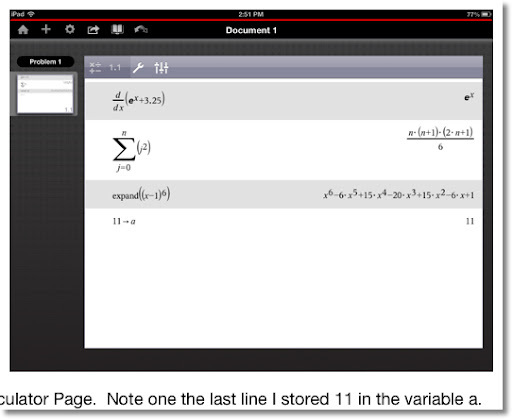 Each page can be a mathematics page, graph page, a spreadsheet, geometry page, or a statistics page. Within the problems in the document, variables are linked. That is, you can create a variable in one page, and it is define throughout the documents. Programs work the same way. 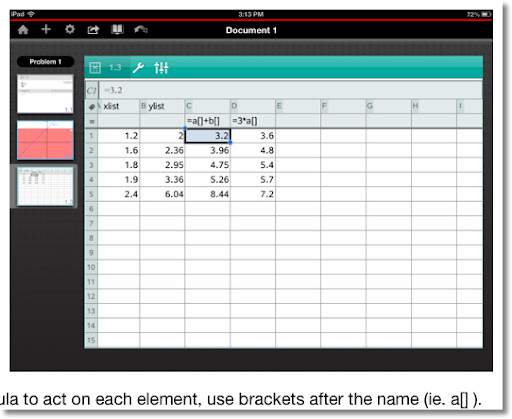 Programs are in TI-Basic and can either be limited to the document or made global. The global feature is very useful when you are creating custom functions (like the gamma function). Programming on the nSpire is more strictly for the mathematical sense; so if you are looking to make video games, this app may not be what you are looking for. Holding the r key gives you access to the θ variable. The var key contains the STO> function. 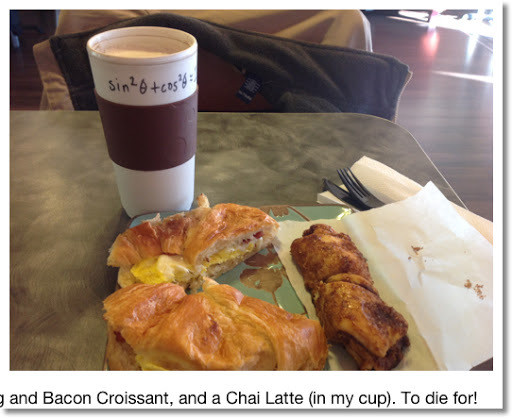 The sin key expands to sin^-1, csc, and csc^-1. The best part of the keyboard? The keys are big! Well, we are on an iPad here. On the graph page, not only can you graph functions, polar functions, scatter plots, parametric functions, and inequalities, you can do it all one page if you want. 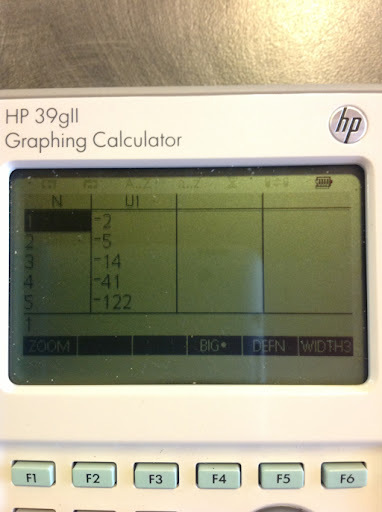 This adds flexibility that is usually seen only on the Casio graphing calculators and somewhat on the HP 49g series. 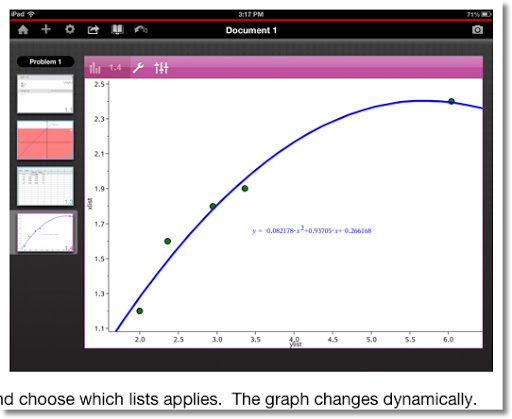 The graph page offers a geometric view or a 3D view for three-dimensional graphs. 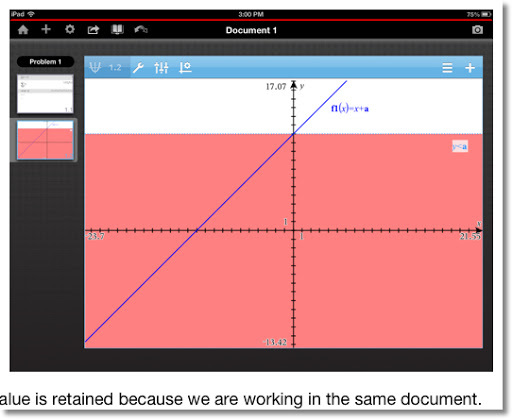 Pinch to zoom, hold on to drag the graph and any other text. Here are the screenshots from the app. All the shots are from the CAS version. I recommend getting this app. Now I realize that the $29.99 price tag is heavy in the market on apps, but this app has it all together in one package. However, in the market of complete mathematical software packages it is inexpensive. If you buy it, I recommend the CAS version. This is also a great alternative to getting the hardware if you don't want and/or have $150 to spend but have an iPad ready. And the batteries last longer! At least with the app I don't have to constantly plug in my tangible nSpire CX almost every time I want to use it. And yes documents can be shared by email or downloaded to the computer for later use (including downloading it on the physical units). That is all for today, please go check out Mike Grigsby's blog. I can't wait to meet with him tonight. Have a great day and weekend everyone. One of the missing features of the TI-82/83/84 family is the ability to convert between bases. Here are two programs in TI-Basic to help fill at least some of the gap. It is very basic conversion, working only with positive integers up to 65,535 (16 ones as its binary representation). 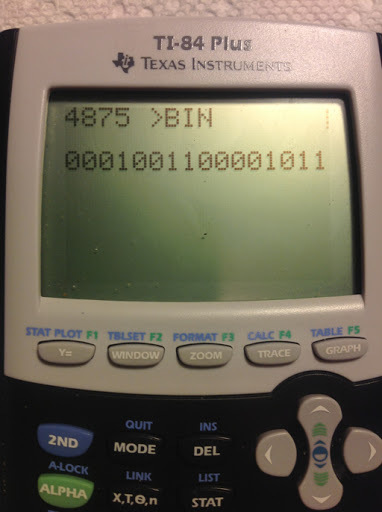 The programs display the binary numbers as a solid number, rather by a list. This is accomplished by a For loop involving the Output command. Access L1 by pressing [2nd], [ 1 ]. This program works with any positive integer from 0 to 65,535 - 16 bits. No negative numbers. Note: ending quotes and parenthesis are left out to conserve space. Binary to Decimal (L1 → N). Enter a list up to 16 zeroes and ones. Continuing the Saturday night tour, I stopped by at another coffee place, the Swörk Urban Coffee Bar in Eagle Rock (Los Angeles). Author: Christopher R. Mitchell, his website is http://www.cemetech.net/. To make this short and sweet, this book is an excellent reference book, for all levels. I have 22 years of calculator programming experience - starting from the TI-81 in 1991. However I am learning new tricks and techniques from this book. 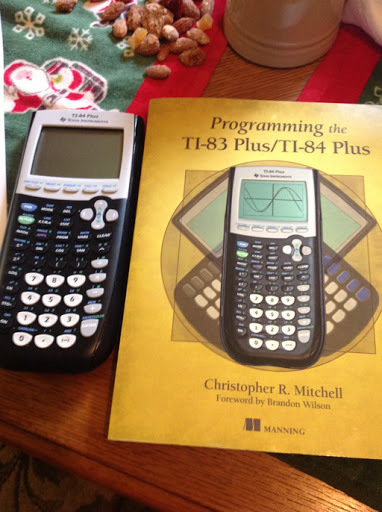 The book aims towards the TI-83/TI-84 family and how to maximize programming efficiency. I focused on the later chapters of the book, where topics cover the GETKEY command, using the home and graph screen to efficiently display text and figures, and how to make programs interactive. There is also a chapter on how to optimize programs, such as taking advantage of implicit conditionals and use of the last answer (Ans) function. So far, the GETKEY is my favorite thing I am learning. The list price is $29.99, which includes the book and electronic copies of the book (I have yet to download the electronic copy.) If you want to expand your programming skills, or develop them from the beginning - Go for it, I definitely recommend this book. Mitchell writes the book in a straight-forward manner. P.S. I got to the mouse to eat 142 pieces of cheese. (See chapter 6 to see what I am taking about, readers). Good afternoon all! This is a Saturday Afternoon/Night blog post. 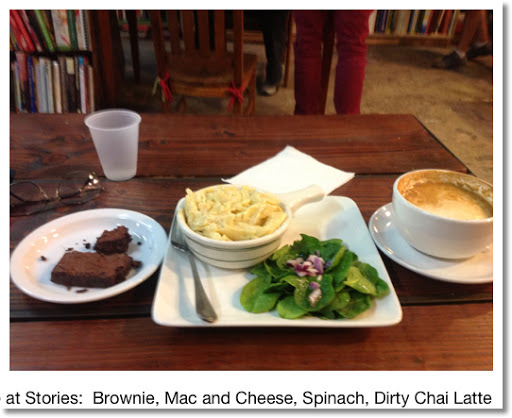 On the menu: much needed delicious food from Stories Cafè in Los Angeles and some work with recurrence relations. But first, an announcement! I am working on a short series of programming tutorials of the Hewlett Packard HP 39gii Calculator. Think of it as a short boot camp to get HP 39gii owners up and running. 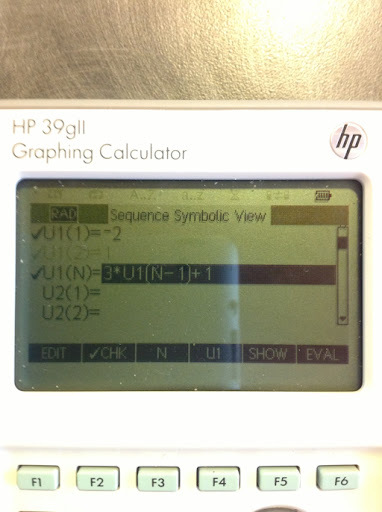 An emulator for the HP 39gii can be found here: http://www.hp.com/sbso/product/calculators-emulators/graphic-calculator-emulators.html. The emulators are for Widows and probably Mac - not sure if they run on other operating systems. As of today, I am not aware if there are any iOS and/or Android apps for this. I aim to post this series in March 2013. (I) a_(n+1) = a_n + n + C with the initial condition a_0 = A_0. The type of recursion formula presented is polynomial recurring relation. A general polynomial recursion formula takes the form a_(n+1) = a_n + p(n). Mainly, with recursion formula of polynomial type will require a formula of order n+1. There are n+2 constants to solve for. Working with equation (II) above, we will need to solve for c_0, c_1, and c_2. It would be very difficult to work with only one equation. Luckily, we can turn this problem in to a system of three linear equations. For the Hewlett Packard HP 50g calculator owners (others may have this function/program), you can get the matrix on the left hand side of equation (IV) by using the VANDERMONDE matrix function on the vector [0, 1, 2]. This function comes in handy for these types of problems. I tried this technique with a_(n+1) = -3*a_n + 7*n - 1 with a_0 =1. With a_1 = 5 and a_2 = 0 from the recursion formula, I came up with a_n = -9/2 * n^2 + 17/2 * n + 1. Using this formula I came up with a_3 = -14, when in reality a_3 = 22. Just a heads up. I hope this weekend and all your future days are good to you. First a correction. 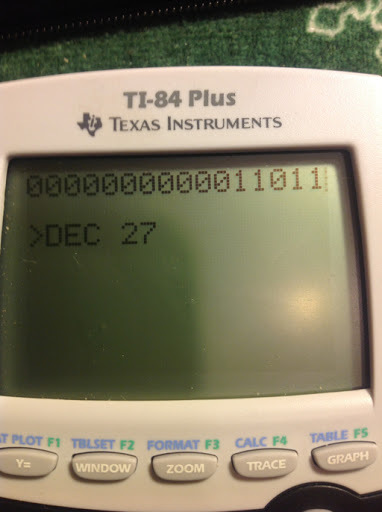 In my Numerical CAS section, posted December 2012, I typed an extra quotation mark in the POLYBINE program for the Casio Prizm - that has been corrected. Much thanks to Ryan Maziarz who pointed that out to me. with the initial condition a_0 = A.
I could try using a characteristic polynomial, but with some observation we may be able to detected a pattern which leads us to a general formula. 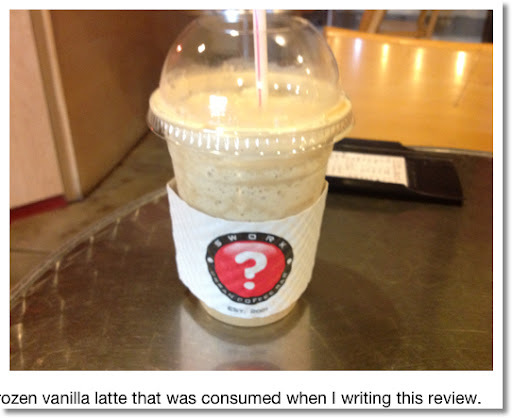 5 blog entries away from the 200th blog entry. Hi everyone. 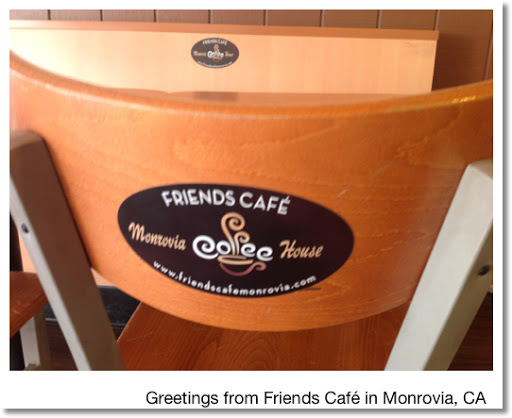 I am blogging from the Friends Café in downtown Monrovia, CA on a beautiful, chilly day. Today's blog entry is about to the Fibonacci Sequence and how to find a general formula to generate a sequence. It is easy to build the sequence. Start with two entries of 1. Add them up to get the next term. Each subsequent term is the sum of the last two. 1+1=2, 1+2=3, 2+3=5, 3+5=8, 5+8=13, and so on. with the initial conditions a_0 = 1 and a_1 = 1. We can generate a general formula for this. This is a linear recursion formula. A way to find the general formula is to use a characteristic polynomial. The characteristic polynomial is formed by turning subscripts to exponents (and usually replacing a with another letter, such as x) and finding the roots of the polynomial. Where n is the number of initial conditions. In the case of the Fibonacci sequence, we have two initial conditions (a_0 = 1 and a_1 = 1). Hence n=2. Then use the initial conditions to solve for the c_k constants. Our next step is to find c_1 and c_2. With initial conditions a_0 = A and a_1 = B.
I am working a basic programming series, which my target is with the HP 39gii calculator and the series would be posted in March 2013. Thank you everyone who reads, follows, and comments on this blog. As always it is much appreciated. We have a loan with an initial balance $b, that has an annual interest rate of r%. We are making a monthly payment of $p every month. In Part 1, we were finding out how long to pay off the balance. In Part 2, we asking the same question, but with an added component: this time assume that there is a monthly charge of $c to the balance. The charge stops when the balance is paid. with the initial condition a_0 = b. Let's get a_1, a_2, and a_3 in terms of a_0. Sandra has a credit card with a 15% APR. The initial balance is $1,500.00. Sandra uses a premium credit card that charges $20.00 each month there is a balance. In 3 payments , Sandra has knocked the balance to below the payment amount of $1,500.00. In month 4, the amount will be ($99.64 + $20.00) × (1 + 15/1200) = $121.14, and her debt will be over. Greg has taken a payday loan, for the amount of $1,893.64. The interest rate is 14.99% and the loan incurs a $14.99 holding fee for each month the balance exists. Greg makes a $350.00 payment every month. At month 6, the final balance will be ($303.95 + $14.99) × (1 + 14.99/1200) = $322.92. We can find out when the balance is zero by solving for n.
Then the integer part of n, int(n), is the nth payment when the balance is less than the payment amount. This means the balance is below the payment after then 3rd payment. The balance becomes below the payment after the 5th payment. 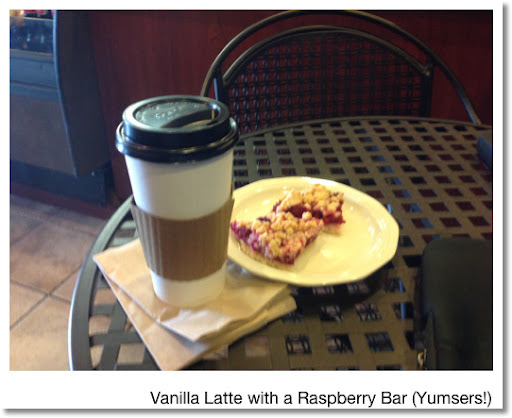 Greetings everyone coming to you from a Starbucks in Covina, CA! (on my way to seeing my mom and some friends for dinner). 1 month of 2013 is already in the books - hope everyone is getting February off to a great start! The topic of this and the next post: using a recursion formula in financing. The scenario: You have a loan that you make monthly payments. Interest accrues each month based on the loan's balance. The rate is stated as an annual rate. How many months will it take to pay off the loan? For this, we are going to use a recursion formula to describe the balance at the end of each payment. We will then come up with a general formula which will allow us to find the balance at any month. Finally, use the general formula to find when the balance is zero (approximately). Part 1 will deal with the scenario stated. On my next blog entry, I will consider paying the loan balance when a monthly charge is involved. What is a recursion formula? A recursion formula is a formula in which the result is based on previous results. To generate a sequence of answers, one or more initial conditions are required. a_(n+1) = 2 × a_n + 1 with the initial condition a_0 = 0. In order to calculate a_(n+1), you will need the previous result, a_n. Some recursion formulas can be transformed into general formulas, where any nth term can be found when only the initial conditions are known. a_(n+2) = a_(n+1) + a_n with the initial conditions a_0 = 1 and a_1 =1. Back to our scenario: You have a loan that you make monthly payments. Interest accrues each month based on the loan's balance. The rate is stated as an annual rate. How many months will it take to pay off the loan? Note: we will stop when the balance sinks below the payment amount. At that point, the next payment is the balance, reducing the debt to 0. A bank loan is made for $1,000, which has a 10% annual interest rate. The borrower plans to make monthly payments of $300. The balance on a short term lease is currently $8,764.10. The lessor wants to make payments of $1,500 until the balance is fully paid. The lease carries an interest rate of 4.95%. When will the balance be fully paid? Taking the integer portion of n, or int(n), gives the nth payment when the balance is less than the payment amount. After 3 payments, the balance is below the payment amount of $1,000.00. After 5 payments, the balance is below the payment amount of $1,500.00. Next time will be Part 2. Thanks as always! P.S. To all those who are partaking in the Super Bowl festivities this Sunday: please be safe - and don't drink and drive! And have fun.